Walt started his sports career at Amphitheater High School where he played baseball and football for four years. At the University of Arizona he excelled at baseball. In 1949, he made the National Semi-Pro All-Star team. 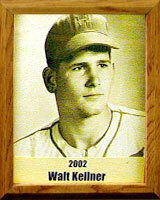 Kellner went on to play professional baseball with the Philadelphia Athletics (1952-53); AAA Denver, Columbus and Ottowa (three years); AA Oklahoma City, New Orleans, San Antonio and Mobile (four years); and A League in Lincoln, Neb., for one year. His coaching experience includes two years in Pony League; five years with Amphi Little League; three years Amphi Senior League; three years American Legion; and four years City Semi-Pro. Walt is a member of the Major League Baseball Players Alumni.